Stories within stories always make for a tricky narrative pathway. Dedicate too much time to the fiction-within-the-fiction and it's easy to become lost in a world that has no real stakes, but focus on the real world too much and the internal story feels more like an afterthought than a piece of thoughtful storytelling in its own right. Nocturnal Animals, Tom Ford's second directorial effort, plunges head first into the story within a story narrative with such conviction that, for a long time, it's easy to forget what is fictitiously real and what is fictitiously fictional. But then, as both stories develop, you slowly come to realise that you are invested in both narratives equally. Ford's screenplay is incredibly intricate in the way it balances reality and fiction, and he allows the stakes of the fiction to exist within the reality. This is all probably sounding very confusing if you don't know the basic premise of Nocturnal Animals. I would argue, though, that this is a film that benefits from the viewer going in with little knowledge of what it contains. Nocturnal Animals is a stylishly unpredictable film, and the less you know about the path it takes to its thought-provoking and discussion-inviting conclusion, the better. Susan Morrow (Amy Adams), an artist, is struggling through her second marriage. Her husband is distant to her, and she is pretty certain he's cheating on her. Soon, her first husband Edward (Jake Gyllenhaal) sends her a book: "Nocturnal Animals". This was what he used to call her, she soon reveals, as she rarely sleeps. Intrigued by why her ex-husband would send her this book at a seemingly pointless moment in her life, she reads it. It is dark, sad, disturbing and moving. The further she reads, though, the further her mentality and state of mind is troubled by its contents, as well as the characters' stark resemblances to herself and her family. Suffice to say, a great portion of Nocturnal Animals consists of Susan's visual interpretation of her ex-husband's book, which, obviously, isn't real and doesn't happen. Within the world of Edward's book, there are no narrative stakes. Ford directs the early book sequences with such determination and intensity that its very easy to forget that they hold no real weight as we get swept away in them, but as they develop we begin to realise how they affect the real world, forming their own unique kind of emotional tension. Nocturnal Animals, paradoxically, is a film about a story that doesn't really focus on story. Its main goals are looking nice, feeling dark and getting us deep inside the mind of its fragile protagonist. The lack of story direction may be troubling in some of the earlier moments, but everything that Ford wants to do here, he does masterfully. As one would expect from a fashion designer turned film director, everything here is stunning to look at. The cinematography isn't flashy, but it's stylish. The camera doesn't soar around corners or whizz through the air, but it allows itself to hold and focus on the small moments and what they mean and the feelings they evoke. Ford also uses his visuals to reflect the themes of the film. Nocturnal Animals is a film about identity and self-perception, as well as our perception of others and how this affects us. Characters are repeatedly shown through mirrors and reflections: the film's penultimate sequence consists solely of Susan looking at her reflection (how she sees herself) to adjust her make up (how others see her). Further to this, Susan is repeatedly framed as a mere reflection, only faintly visible in the glass surrounding artworks, some hers and some not. This expertly portrays what the film is saying without the dialogue bearing down on us, as Ford's script avoids every option of exposition or meaningless information. When we're unsure of what Susan is feeling, we cut to a book sequence or a flashback, and by the time we return to the present we understand her without difficulty. In someone else's hands it might feel like cheating, but under Ford's direction it all comes across as smooth as the glass Susan is always reflected in. This intricate narrative structure only works as well as it does due to how convincing Adams is as Susan. Her uneasy mind frame is expertly conveyed across Adams' face, and her almost empty and lifeless body language in certain sequences tells us more about her character than words ever could. Adams is a superb actress, though, and she doesn't let Susan slip into one-note territory. In a flashback scene we watch as Susan tells her mother that she isn't like her and won't back out of marrying Edward, and she comes across as strong and powerful and sturdy. One cut back to the present, though, and her body language is entirely different. It's another excellent performance for Adams' to add to her resume, especially following her Oscar-worthy performance in Arrival also from this year. Supporting performances are also strong: Gyllenhaal tackles his dual role well, finding distinct differences between the real Edward and the fictitious Tony but keeping enough similarities noticeable that we can understand why the story is so hard-hitting for Susan; Michael Shannon delivers as Detective Andes, successfully balancing grit and subtle background emotion; finally, Aaron Taylor-Johnson makes the most of an understandably underwritten character with his conviction to a severely unusual character type for him. For the film to truly benefit from its visual and structural storytelling, the performances need to carry us through all of the time jumps and tonal shifts. Ford's cast do his film justice. Nocturnal Animals shines through its own intimacy, and its own conviction to its themes and character beats. The film's closing sequence invites deep discussion as to whether or not a character is strong or weak based on their final actions in the narrative, and it has the potential to change the framework of everything that preceded it. Adams carries the film on her capable shoulders with her confident and assured performance, but its the focus on character and thematic content that allows everything to feel as polished and stylish as it is. Ford has presented a deep and clear understanding of how we view ourselves and how we appear to others, and he has bound this to a dark and looming tale of a woman caught up in the idea of self-perception. This would be enough for most directors to feel satisfied, but Ford goes one step further and ensures that his film is about as visually sumptuous as possible. His camera lingers on faces the way we sometimes linger on our own should we catch ourself in a reflection anywhere. No matter the reason, there's something incredibly unusual about seeing your own face, and Ford has captured that feeling perfectly in a film that is incredibly focused on self perception, but isn't afraid to dive even deeper and look at how we can find ourselves within art, and within stories. The result is something that, if still a little rough around the edges, is almost impossible to look away from. 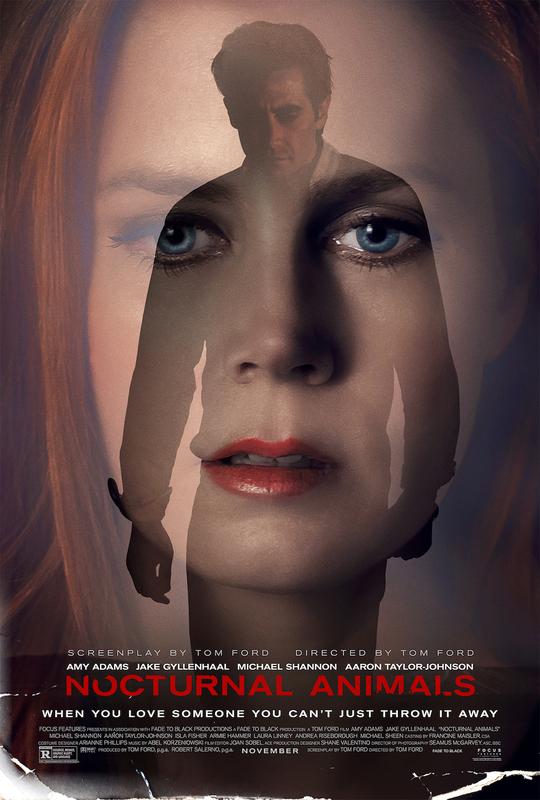 To Summarise: Beautifully written and exquisitely performed, Nocturnal Animals uses its tightly paced narrative to tell an intricate and psychologically disturbing story with a deeply thought out analysis of self-perception and identity.